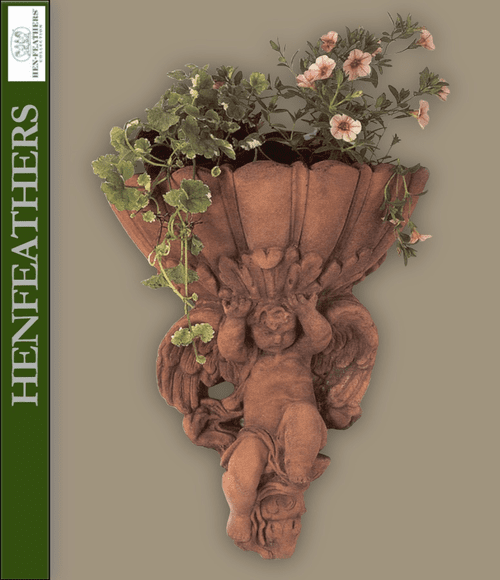 The Vintage Angel Wall Cachepot features a beautifully sculpted angelic cherub with wings design. This planter is available in antique terracotta or white terracotta patina and has 2 holes in the back, one for hanging & one for drainage. This design is carefully hand molded and hand finished by craftsman to the highest standards of detail in a composition of terracotta, bonded marble and fiberglass to guarantee weather and frost proof durability. Each design is carefully packed and transported to any destination.